Green Screen photo / Chroma Key photo effects are easy. Replace blue and green background easily. Once you have photographed your talent in front of a green screen, use our chroma key photo editor to choose a background and just click on the background once. The green or blue background will automatically be replaced by the digital background of your choice! This simple photo editing technique offers immense creative potential for the users. For example you can portray the users as if they are on a famous magazine cover, with their favourite celebrity or in exotic locations around the world. Best of all, it's easy to use. You just need to click on the green or blue background of the photo and boom!, it's replaced by the new digital background of your choice. Just like that. A common problem in green screen photography is the presence of wrinkles on the canvas backdrop. Our chromakey software is quite resistant to the bad effects of wrinkles in the background cloth. Another common problem is variable lighting in the background and foreground. This is also adjusted quite well by our green screen software. Software can replace both green screen and blue backgrounds in the digital photos. Move the foreground anywhere relative to the background. Adjust canvas size according to background or foreground. Scale background according to foreground. Green color spill over adjustment. - "Amazing results. Saves both time and money." - "My kids love this green screen photo program for their holiday green screen photography projects. Very easy and effective software." Who should use green screen photo software? What do you need to get started with green screen photography? A green background or a blue background. Green color is not essential for getting the digital effect you want. You could easily use a blue screeen background and get the same digital effect as the green background. It wont make a difference. Just try to get whatever color out of blue or green is easily available and is economical. This could be a canvas backdrop or paint on a wall. If this is a canvas, muslin cloth is preferable as a backdrop. While it preferred by most software that the backdrop be neatly ironed, we understand it is not always practicle to iron the backdrop. So we designed our green screen program to work well with a reasonable level of wrinkles in the backdrop. You can hang the backdrop against a wall and spread it out nicely. If the background is paint, please make sure that the paint is of decent quality but not at all glossy. The glossy paint is going to reflect light and leave hot spot reflections at several points where light reflection is maximum and it will spoil the overall compositing of the digital photo. In the end this will lead to poor results despite the best quality of the software. It not magic afterall! The lighting should be from at least two sides to evenly light up the background. The lighting should be such that the subject will leave no shadows. The better lit your backdrop is during the photo shoot, the better off you the results of the software! The color keying operation is better if lighting is even. But better lighting doesn't mean extra bright lights! Please be reasonable. While the sense of fashion is upto the model and to you, please do not wear shiny material. Please avoid wearing metallic accessories like metallic band, jewellery etc. The reason for this is that these shiny surface will reflect the green background and over spill. Parts of the subject might get erased when the photo is composited using the software program. Keep her at least 6 feet from the green backdrop. Many people recommend a distance of about 8 feet from the green or blue backdrop but we understand that not everyone has the luxury of a large space in their studio. Your photo camera and our green screen photography software. Remember, many professional photographers have used this technology before you. We have worked hard and given our best to design our editing software to boost your creativity. You can just focus on selecting the best suitable backdrops for your subjects. Postproduction is the context of digital photography is the process of working on the photograph after it has been clicked by the digital camera. Typical postproduction is performed by the use of appropriate digital software to improve the photograph by adjusting exposure, contrast, brightness, colors, hues etc. Others could also be cropping, watermarking etc. Replacing background of digital photos brings a whole new interesting dimension to how the final finished picture presents itself. A subject could have been photographed inside a studio or a booth but could be shown in front of the statue of liberty! 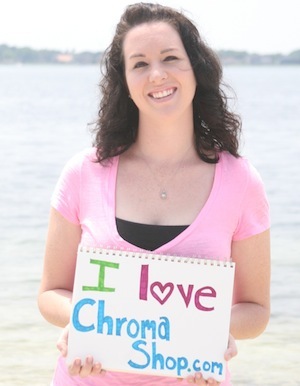 Chromashop's software is about color keying only. This is also known as color compositing or green screen software. We have made a great deal of effort to take the expertise out of creating amazing color key effects using just a few clicks. Even children can do it, not to mention professionals. The green screen software mac version can be installed with just double clicking on the dmg after downloading and the green screen software windows version has a windows installer as .exe file (executable file ). Both are less than 30 MB in size, download fast and come bundled with the same set of digital backdrops. Would like to point out these are green screen photo software only. There is no video version for either mac or windows as of now and we are only focussed on creating the best green screen program for now. Chromashop is also used nicely as a photo booth software in events on mac and pc. It gives good entertainment to visitors in fairs and events. How Easy green screen photo editor is! This photo editor for green screen editing is surprisingly easy to use compared to other such green screen photo software in the market. The software has been designed to be used for lay people and professionals alike. One click is all it takes to replace the background nicely. Of course, you photography skills matter too. A nice photography by a technical photographer will yield better results than those of an amateur, but the software helps in reducing the gap and the skills required for such chroma key compositing / color keying / color masking effects and an economical price. Previously people needed to learn photoshop skills before they could attempt anything like this, but not anymore. Chromashop editing tool allows you to focus on just your creative work and not spend days learning photo tools. All these design decisions have enabled this to strive to be the best chroma key photo software in its category. It works both on Mac and Windows operating systems. Many people own both operating systems and they don't have to look for different tools for each. Short answer to why green background for photos: It is most different from the human skin tones. Long answer to why green: There are scientific and practical reasons behind using green backgrounds or blue backgrounds in photography. Suppose you use a black background behind the person being photographed. What would happen? The the black color is keyed out, the black color in the person's and eyes would also be masked out. That is, his hair would vanish and so would the color of his eyes (if black). Similarly a pink background would make the pink in the skin of a person vanish. Green and blue are the two color which have been known to effective in photo compositing because they are the farthest removed from the skin tones of most humans. However if a person has green hair, a green background would indeed make her hair disappear in the resulting processed photo. In such a case a blue background would be more suited. In practical applications such as weather forecasting studios, professional advertising setups, green has become more popular because blue is also a color that is poplularly used in clothes, especially men's clothing be it shirts, coats, trousers, ties. Many times, there are blue shades that people wear and they tend to interfere with the blue background. Because of these reasons green has indeed become very popular with photographers and video studios alike. Command line chroma key version also available. © Copyright 2018, ChromaShop.com All rights reserved.